Italian software company KARALIT announced the free downloadable release of their new KARALIT CFD software which utilizes what they call the Immersed Mesh method. They claim to have virtually eliminated the time required for preprocessing by utilizing a hyperbolic body fitted grid in the near-body regions. 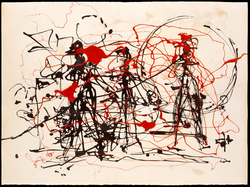 Jackson Pollock – Experimental Fluid Dynamicist? Altair announced the release of their HyperWorks 11 CAE software suite including the addition of CFD software AcuSolve and NURBS-based 3D modeling and viz software solidThinking. Altair claims that HyperWorks is now the most comprehensive, open architecture CAE suite available. While not this isn’t strictly CFD news, Spatial (the ACIS people) announced the release of CGM, the 3D geometry kernel behind CATIA V5 and V6. Calling it the first new 3D kernel in over a decade, Spatial says it will provide the basis for CATIA-compatible applications as well as SolidWorks V6 which is said to be CGM-based. Streamlined FutureTruck reduces drag 63% versus traditional big rigs. NASA scientists simulate landing gear noise using FUN3D. See what happens when smoke rings collide. This entry was posted in Applications, News and tagged AcuSolve, Altair, CATIA, CGM, free fluid jet, FUN3D, HyperWorks, Jackson Pollock, KARALIT, landing gear, smoke rings, Spatial. Bookmark the permalink.